Burdock (Arctium lappa) – Releases stuck, suppressed anger imbedded deep in your body and energy fields from both present and past life experiences. Detoxifying. I AM release of stuck suppressed anger. Burdock is a biennial herb that grows in meadows, sunny edges of woodlands, and cultivated beds. Originally found in Europe and China, Burdock now grows in most temperate regions around the world. Burdock is rich in chromium, iron, magnesium, silicon and thiamine (vitamin B1). Stalks and leaves can be harvested in spring and early summer. Roots are harvested in fall of the first year and can be eaten fresh during the winter months or dried for tea. Medicinally, burdock root is widely used as a blood purifier to cleanse and eliminate toxins, including heavy metals. It relieves skin problems, sluggish digestion, and arthritis. It can be applied externally for skin sores, acne, fungal infections, bruises and skin inflammations. Burdock root is often used in combination with dandelion root. The seeds are in round pods with burrs that stick to everything. This was the inspiration for Velcro. Use Burdock Flower Essence when you are caught up in deep old anger, especially if the anger is directed at someone, usually an authority figure. Although the anger may be triggered by a current person/situation, the origin for this quality of anger is from a wound earlier in this life or a past life. This anger may also be related to an experience of grief or loss. Physical symptoms may manifest as arthritis; skin issues like eczema, shingles and boils; or toxicity - including heavy metals - in the liver, gallbladder, large intestine, or blood. If any of these symptoms are common in your family lineage, you may also want to consider Bloodroot Flower Essence. Burdock Flower Essence removes emotional patterns of anger stuck in your energy fields and body from personal experiences this life or a past life. The “burdock kind of anger” may be turned inward toward your self, but typically it is turned outward toward someone or a situation. Sometimes the suppressed anger is coupled with heavy metals. Emotions are actually chemicals – peptides – that bind to cell receptors. The Burdock Flower Essence completes “breaks” in the energy circuits that affect how the emotions and heavy metals have become bonded. The essence does not actually chelate the heavy metals. However, it supports the energetic process of those bonds “unraveling”, which allows the body to release both the anger and the metals. I have no scientific proof of this. However, I have seen how this has happened for my clients and myself. The Burdock Flower Essences also encourages you to nourish yourself and enjoy life. 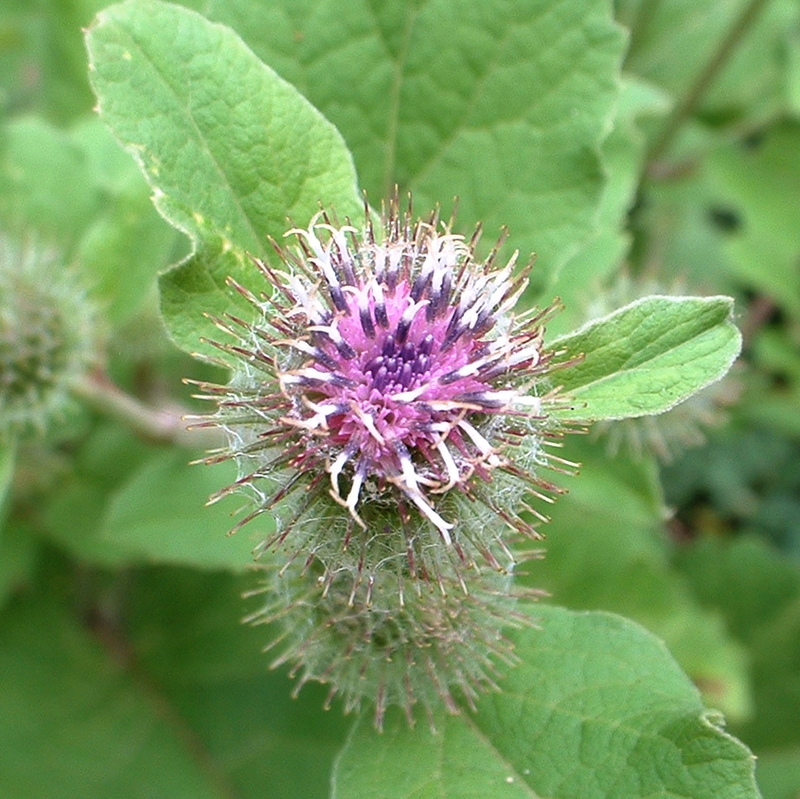 Burdock is a key flower essence in both the Liver and Gallbladder Organ Energy Meridian Blends, and is a supporting essence in the Large Intestine Blend. Burdock Flower Essence was made by the no-pick method of working directly with the plant spirit. While the essence was being made a matrix of amber, angel wing, black tourmaline, charoite, chrysoprase, drusy quartz, golden labradorite, icosahedron quartz, and shattuckite crystals were placed among the plants with the storage (mother) bottles. The sun acts as a transformer to step down spiritual energies from higher dimensions. While the essence was being made, Amber acted as a lens to receive and focus sunlight for this purpose. It also aligns the subtle bodies with the physical bodies, transmutes negative energy into positive energy, and emits a sunny and soothing energy that calms and enlivens the disposition. Angel Wing purifies the emotional subtle body, calms the mind and helps you sense the protection of your angels. It helps to dislodge crystalized emotional patterns from your energy fields, dispels old habits of vengeance or resentment and facilitates forgiveness. Black Tourmaline releases worry, anxiety and negative attachments. It purifies and protects your energy fields while grounding your energy circuits into the Earth’s circuits. Black tourmaline also purifies the body of toxins and waste, including heavy metals and environmental pollutants. Charoite releases victimization and negative emotions, and enhances courage and appropriate assertiveness. On the physical level, it can help to improve the condition of a diseased liver. Chrysoprase aids you to see karmic influences in emotional patterns, heal a wide range of emotional imbalances, and release old belief systems and actions. Physically chrysoprase is detoxifying, helping to move heavy metals out of the body, and stimulates liver function. Drusy quartz crystals help to energize and stabilize your subtle bodies. Golden Labradorite purifies the organs that operate the body’s purification system. It teaches the right use of will and power, and encourages consistent action. Icosahedron cut quartz has 20 (5X4) equilateral sides. It is a bridge between the 5th Dimension - the entry into the unified Spiritual realms - and the 4 cardinal directions (N, S, E, W) on Earth. Shattuckite is a calming and soothing stone when you feel judgmental, reactive or aggressive and it brings you back into alignment with your truth and integrity. The actions of the crystals inform the way this flower essence seats into the body/mind. While Burdock Flower Essence was being made imprint of spirit song coming through Diana’s voice was infused into the essence.